This is a quick break from my six post series of machines I do take out of the house to type, though it is relevant so think of it as bonus material. Recently I acquired one the Underwood portables with the aluminum tripod built into the case. I had wanted one for some time, since there are many places and situations in which such a machine would be extremely useful. The above photo at the laundromat is an excellent example. I am not in love with the machine... there are several shortcomings to the Underwood design. Ribbon advancement and automatic reversal and the indexer are both common fail-points, though this particular machines works fine (after I switched the indexer with another machine...) And so I am not enamored of the design from an engineering standpoint. Aesthetically it is hard to find a sharper machine. The worst thing about the typewriter though is a somewhat heavy touch, even on the lightest setting. The case is brilliant! The legs fold out and are each in three sections, hinged rather than telescoping. This means the case cannot be leveled on uneven terrain, in the woods perhaps, but it makes it much more compact. I had assumed from photos such cases as there would be unstable but that is not case. It would take quite a push to topple one over and it is sturdy enough for fast typing. I have found my legs do not fit underneath, but if I put my right leg on the outside and over one of the tripod legs I can sit very comfortably and the height is appropriate for most chairs. Overall this is a useful and desirable machine. If I find another I think I might remove the brackets inside the case and see if I cannot install the mounting brackets for a 1940s Royal providing one would indeed fit. Then I would have the ultimate urban-writing-machine! To see more photos of the Underwood please click this link to the Typewriter Database and feel free to check out the rest of my collection too! How wonderful! When I regularly used a laundramat I did not type. Typing while doing laundry is a great idea. Is that a decent speaker stack aside the change machine? I knew of one laundamat in Roanoke, VA that did have a great sound system. BTW. wonderful machine even if it is not one of the better Underwoods. Get an early 1900 one and they are fantastic machines. They lack bells and whistles of mondern machines, but will out type any German or Swiss or other machine. I kinda figured a Champion was one of the better Underwoods, and it's a good machine if not a great one. I have a fairly large collection and so I am pretty picky sometimes. I think those are shelves and not a speaker. 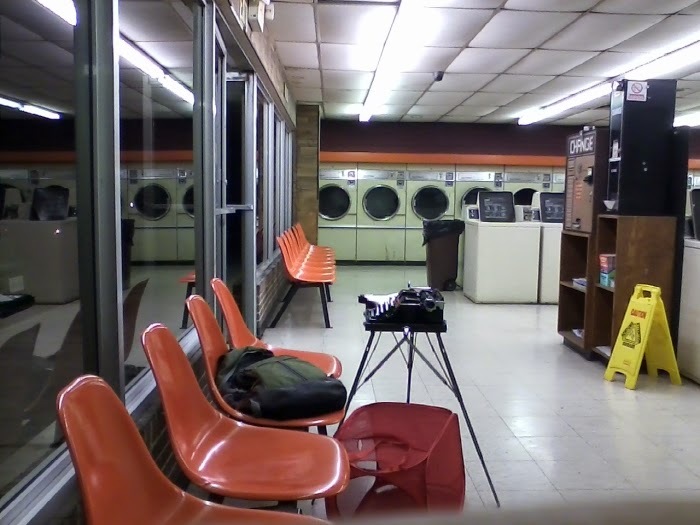 This is a junky laundromat, nothing fancy. I have to say that I absolutely love the photo. That's got great line, great colour, and intriguing composition. Is that not what the little button (or in this case the pull-out) on the left side of the platen is called? The device which allows you to adjust the roll of the platen in respect to the platen gear?